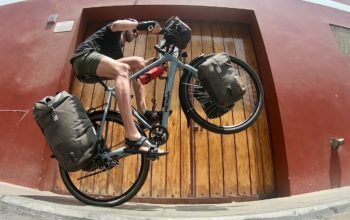 The Surly Long Haul Trucker and Surly Disc Trucker are some of the best off-the-shelf touring bikes you can buy. 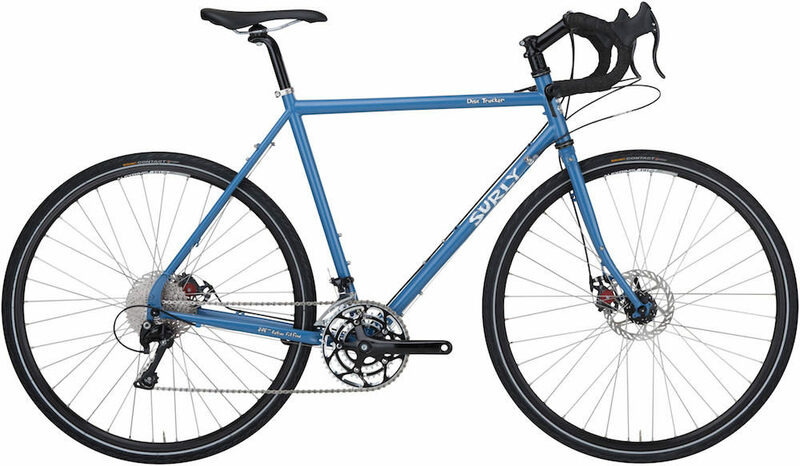 The Surly’s performance is exceptional, their price is right and they have great worldwide availability. The Latest Surly Disc Trucker touring bike! I originally purchased my Trucker as a frameset, as I had a pretty good idea of how I wanted to build it up. My frame then went through many builds over the years as I experimented with parts: different brakes, different handlebars, different wheels and an evolution from derailleur gears to an internally geared hub. Basically, I used and abused bike parts and setups until I got the Trucker to a place that suits me. When I’m loaded with gear, I liken my Trucker to a sailing boat: it seemingly floats over bumps, and the direction change is slow and gentle. This is the way a touring bike should feel. I think that the geometry of the bike is close to perfect. The steel tubing used in the frame’s construction allow the Trucker to excel as a touring bike. The Surly Disc Trucker touring bike has been a solid performer for over a decade. The Trucker’s geometry is relaxed, which allows the frame to handle panniers comfortably. The chainstays are longer than most touring bikes, which is important for both the bikes stability and for heel clearance from your pannier bags. 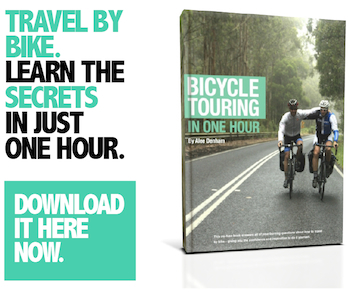 To understand touring bike geometry further, check out my guide available HERE. I haven’t managed to break my Trucker on the roughest roads. The only time I have seen damaged Truckers is when people over tighten kickstands to their bikes. Both Surly and I say, don’t do that. That said, 2017-onward Truckers come with a kickstand plate so this problem will now be few and far between on older model bikes. The Surly Disc Trucker touring bike from above. – 4130 steel frame; it’s comfortable and field repairable (to anyone who knows how to use a welder). – It’s the ideal touring geometry: when fully-loaded the handling is stable and smooth to ride. The front end is nice and high too. More on geometry HERE. – There are frame sizes for everyone – the smallest frame has a 50.5cm top-tube and the biggest a 62cm top-tube. There’s a size for all cyclists between 150cm through to 200cm. – 26″ wheels are available in all sizes but 64cm. – 700c wheels are available on frame sizes larger than 56cm, as toe overlap and bike proportion are less of an issue with bigger frames. – There are lots of mounting points for racks and mudguards on the frame and fork. – The 36 spoke wheels are nice and strong. – Shimano’s cup and cone bearing hubs are simple to rebuild when the time comes. – The Shimano XT rear derailleur is durable and shifts well. – There’s space for three water bottles on the frame. – There’s a spoke holder for a few spares. 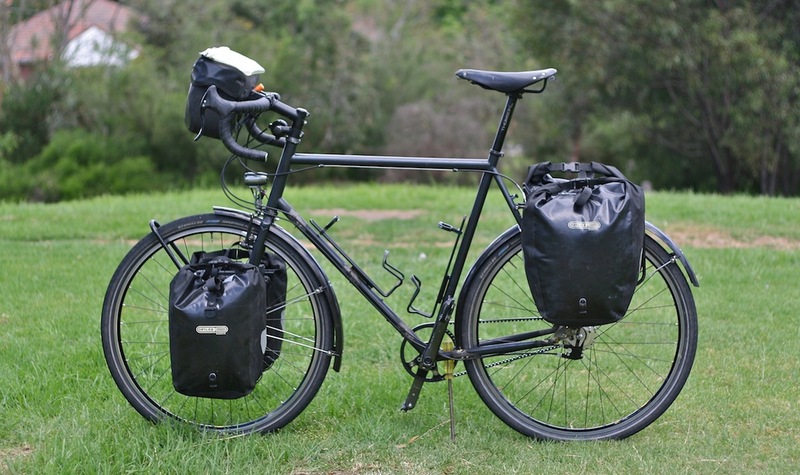 – The Trucker’s long chainstays make the bike feel stable and increase the heel clearance from your pannier bags. 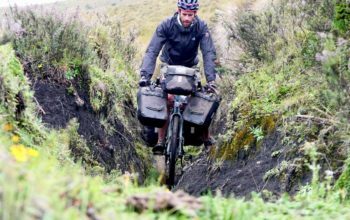 Surly chainstays are often 20-30mm longer than a lot of other touring bikes, but many manufacturers are now moving towards longer lengths. – Surly’s don’t look flashy or expensive to potential thieves. – I’ve never seen a warranty issue for one (not to say this doesn’t happen). The Surly Disc Trucker touring bike from the front. – The stock rim brakes on the Long Haul Trucker are truly terrible – I highly recommend an upgrade to v-brakes (read about brakes HERE) if you have to have rim brakes. – The bar, stem and seat are of average quality. Easily interchangable. The Surly Disc Trucker touring bike from behind. 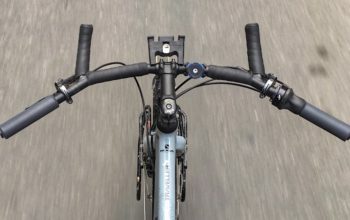 – A handlebar change may suit you if you’re a beginner, you don’t like the feel of a road handlebar or you’d prefer a more upright positioning (read about touring handlebar setups HERE). Remember to buy one or two sizes up for flat handlebars. – The brakes on the Long Haul Trucker do need to be swapped to a better quality cantilever, or v-brake setup (read more about touring brakes HERE). – The Continental tyres are decent enough for touring, but when you next need a set you should ride with Schwalbe because they make the best tyres around. – If you’re using the road handlebars, I recommend employing some ‘cross levers’ to have braking capability at the top of the handlebar. I loved my Trucker so much that I took it to a frame builder to add some frame features that suit a Rohloff hub and Gates Carbon Belt Drive. 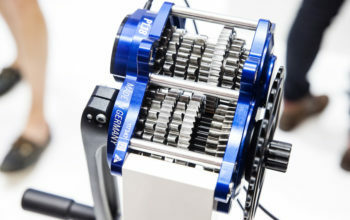 If you’re interested, you can read all the details about Rohloff hubs HERE and Gates Carbon Drive HERE. – An extra bidon braze-on on the downtube to run two oversized water bottles on my frame (this is not necessary anymore with an adapter). – Rohloff specific cable braze-ons along the down tube and chain-stay. – A split in the seat-stay to fit a belt. My modifications were carried out by Gellie Custom Bike Frames, but any reputable frame builder can add frame details as you like. If you’re thinking of doing a similar build to mine, I recommend also taking a look at the 2016 Specialized AWOL – it’s now Rohloff and Carbon Drive ready from the factory which will save you a dollar or two. Long Haul Trucker or Disc Trucker? If you’re wondering what I recommend between the Long Haul Trucker and the Disc Trucker; I’m a fan of disc brakes. 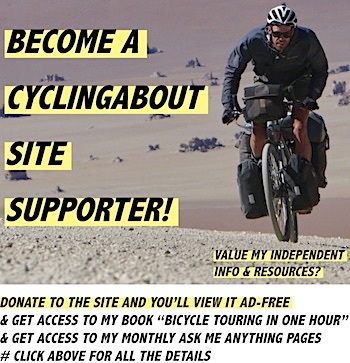 I have cycled over 30,000km with Avid disc brakes on my tandem and have had no problems with their reliability. The extra stopping power is really handy on heavily loaded touring bikes in wet conditions. The Disc Trucker is the way to go! If you need more convincing on disc brakes, you can read my brake article HERE. 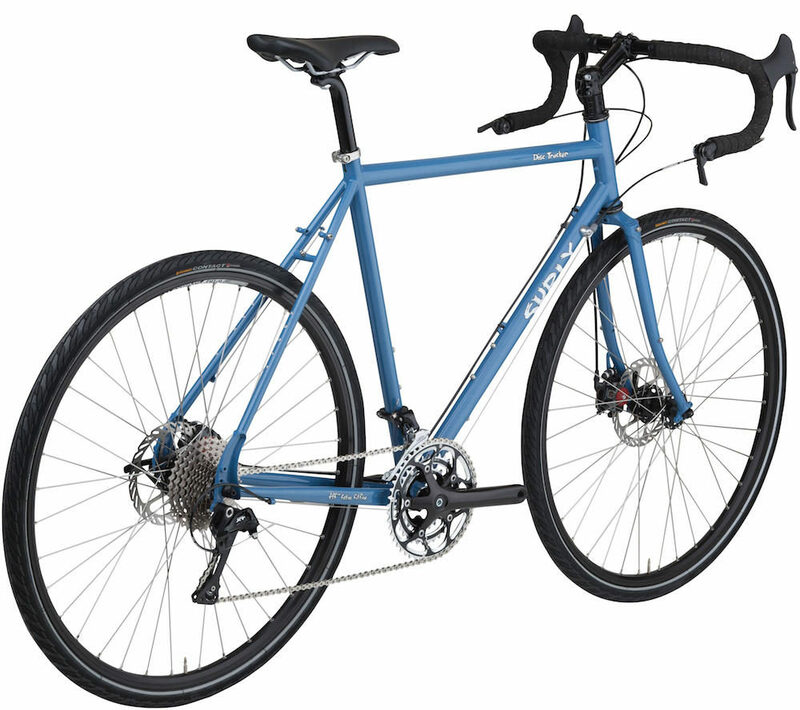 Ride a Surly frame larger than 56cm? You have a choice of 26″ and 700c wheels. I talk about the merits of both wheel sizes in my article HERE. 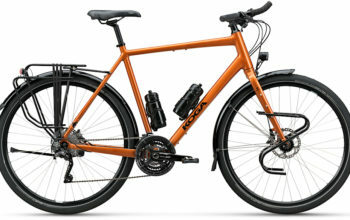 When taking into account the price, performance, and availability of the Trucker, I believe that Surly makes one the best off-the-shelf touring bikes. With minimal changes to the parts spec, you’ll have a very capable and durable touring bike. If you’ve got any questions for us, don’t hesitate to leave a comment below.